Don't let limited space be an excuse to not start your own home vegetable garden. With the hardiness of today's plants and seeds, you can grow vegetables in pots and containers just as if you had a full sized garden. Add some water, sun and lots of love and you will be well on your way. Cucumbers are a great vegetable to grow. They are easy to maintain and yield a high amount of fruit.When they get to the correct size most people will just pick the cucumber by yanking on it and ripping it off the vine.If you use that technique you could be doing more damage to your cucumber plant then you know.Here is how you can properly pick a cucumber. Even if you are limited on space you have an opportunity to grow your own vegetables and fruit at home. Listed in this tutorial are a few ways you can make the most out of what space you do have. Maybe you think home vegetable gardening is a lot of work. The thought of pulling weeds, watering and maintaining a garden, not too mention having to tilling the land is not very appealing to you. But rest assure there steps you can take to eliminate all of those if you are willing to do the upfront work. And for those of you who think you can’ have a garden because you live in a condo, townhome or apartment, read on. There is help in here for you also. You can take every step known to man and you will invariably get a weed or two. They are persistent little buggers and if you don’t get them early, they can turn into the “impossible to get rid of buggers”. Lets start with making sure you limit their access to root in the same soil your vegetables are planted in. Using newspaper you can make a great weed barrier. Put down two layers of newspaper over your soil. Once the newspaper is down, put no less than two inches of mulch on top of the newspaper. This helps to keep the newspaper down as well as provide excellent water drainage and root protection. It also takes away your need to till the land. Taking these two steps will eliminate over 95% of the weeds and a lot of other steps in maintaining a vegetable garden. Then every other morning or in the evening go out to your garden and pick the one or two weeds you may have. A lot of people live in homes that just do not have a lot of land or any land for the matter. When this occurs there are a couple of ways to overcome space issues. 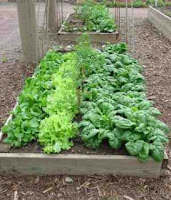 The first way is to utilize raised bed gardening. You simply make a box out of wood, bricks, even hay and fill the box with gardening soil that can be bought at any home center. Just make sure, if the raised sits on top of a patio or concrete and so on, that its depth is no less than 10 inches. This gives the plants roots plenty of room to grow. 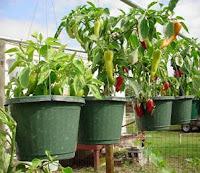 The second way is to grow your plants in pots. Pots aren’t just for flowers, they make for growing great vegetables. Make sure the pot you choose is at least 10 inches in height, has plenty of drainage holes at the bottom and no less than 6 inches in diameter. There is no way around it you have to water. All living things need water and without it life would cease. But you can relax you do not have to spend hours on end everyday watering your garden. Once every 4 days is plenty, every 3 if temperatures are extremely high your area. Use a soaker hose if you have a garden so you can turn on your hose, walk away, and come back in a half hour. This works well for raised beds as well. If you are using pots then you will want to water every other day and give them a good soaking so the soil stays moist. Using a pitcher or watering can will do. Now that you know you can take some easy steps to make life as a home vegetable gardener easier you have no excuse not to get started. I look forward to seeing pictures of your home grown veggies. Here in the Northeast with our seasonal weather, we have issues with certain species of bugs but they are easily remedied since it gets narrowed down to just a few we need to take care of. Up until last year I have never had any issues with the stink bug. Somehow they found their way into our society and now we need to get rid of them if we have any hope of successful crops. First let’s talk about what a stink bug is. A stink bug, also called a squash bug and even sometimes a shield bug, are about the size of a thumbnail with a triangular back that is usually brown and/or gray in color. They are harmless to humans. In other words they don’t bite or spread diseases, at least none that have been reported. But what they do well is attack broadleaf vegetable plants. Not only do they do it well, but the underside of broadleaf plants is a perfect breeding ground for their offspring. And because it is perfect for them they can breed at a very fast pace. Do not fear though, there is help. You can eliminate these pests without the use of chemicals that could not only harm your plants, but the surrounding environment as well. The downfall is this technique will require you to actually do some work. If you are willing to put in the time and effort in, you can get rid of these bugs each growing season. The first step you can take is to never plant your broadleaf vegetables in the same location each year. Of course you should be exercising plant rotation regardless of a bug problem, but most bugs actually hibernated within the soil and when they come out as the weather gets warmer if your broad leaf vegetables aren’t around, they won’t have an immediate food source close by. They may go elsewhere or may simply die from starvation. But let’s say you did that and they have still found their way into your squash crop. If that happens, roll your sleeves up, put on some gardening gloves, grab yourself a coffee can and a lid, and some honey, syrup or molasses (something sticky) and let’s get to work. Your first step is to coat the bottom and the sides of your coffee can with something sticky. Syrup, molasses or honey works well. You will see in a moment as to why we do this. With sticky coated coffee can in hand (don’t forget the lid), put on your gardening gloves, and take a walk over to the area where the stink bugs live. Remember they won’t harm you. Now start flicking the bugs into your coffee can. The sticky substance will help keep them in the can. Just keep taking them off the leaves and putting them into the can. Don’t forget to look on the underside of the leaves. That is where the egg sacks are. You need to get rid of them as well, otherwise the problem will continue. Once you have all of the bugs in the can, put the airtight lid on and place in an area where the sun will shine on it. I think it goes without saying what will happen to the bugs inside the can. Now all you have to do is stay on top of them by checking the plants every other day and repeating this process. If you do this you will get rid of these bugs and their destructive nature form your crops.